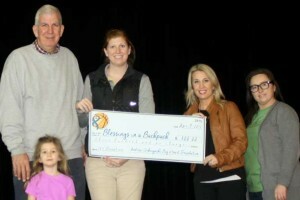 Leon Gobczynski, Kate Uebinger, and Stephanie Gobczynski Uebinger from the Andrew Gobczynski Big Heart Foundation present a $300 donation to Blessings in a Backpack. 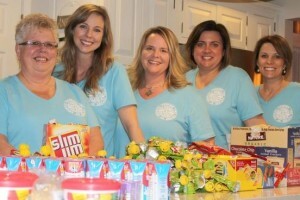 A group of Newark moms want to put a dent in hunger in their community. The women have joined forces to launch Blessings in a Backpack, a national program that provides elementary school children in need with a backpack of food to take home. To celebrate the partnership, a special school tour and backpack-stuffing event was held today at Henry L. Bonsall Elementary School in Camden, N.J. Financial support through EcoMedia’s WellnessAd program will feed 150 children at Bonsall Elementary School for three years. 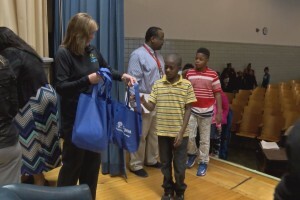 Hundreds of Carver Elementary School students in Richmond went home Friday with a backpack full of food to enjoy over the weekend. Blessings come in many ways. 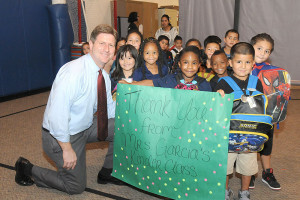 For students at Thew Elementary School, blessings come in a backpack. Brooke Wiseman, the CEO of Blessings in a Backpack spent her entire career in the non-profit sector. Blessings in a Backpack was featured on the Dr. Oz show. Students across the country this weekend will bring home backpacks filled not just with textbooks, but with plenty of food to carry them through to Monday. This is due to the efforts of Blessings in a Backpack. 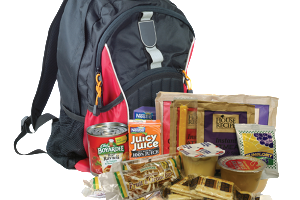 On September 18, 2014, mayors across the country joined forces with local Blessings in a Backpack volunteers in packing bags full of food for children as part of Blessings in a Backpack Day. Through serving on the board of the PGA Tour Wives Association, an organization that has given back more than $5 million over the past 25 years, I have had the opportunity to work with numerous charities across the country while we traveled on the PGA Tour. 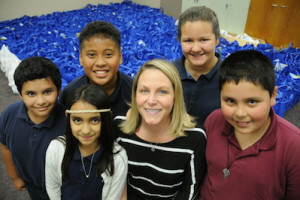 One of those nonprofit organizations, Blessings in a Backpack, delivered a powerful and simple answer to our question.